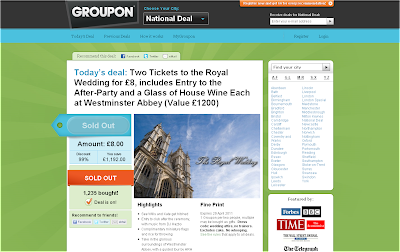 Groupon Royal Wedding April Fools Day national deal - 2 tickets for £8! 'Family weddings can be a tedious affair, putting up with Uncle Barry's distasteful jokes, Grandma's dodgy dancing and the Maid of Honour's flirtatious advances. 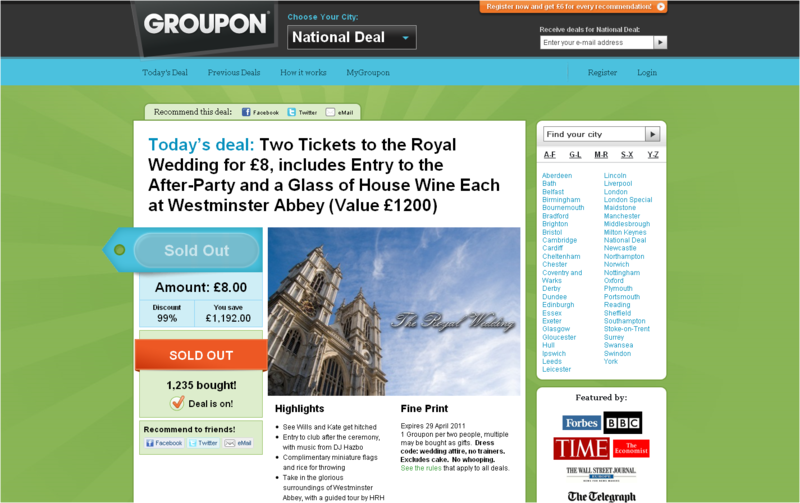 Abandon your own family for someone else's with today's Groupon: two tickets to the Royal Wedding on 29th April for £8. Entertaining and I'm sure most people will get the joke, but maybe should have a more prominent April Fool disclaimer? What a coincidence that I was performing with some of the bestguitarists in the UK! Yeah, sounds like tons of fun. I wish I have heard of that during my stay at luton hotel London.